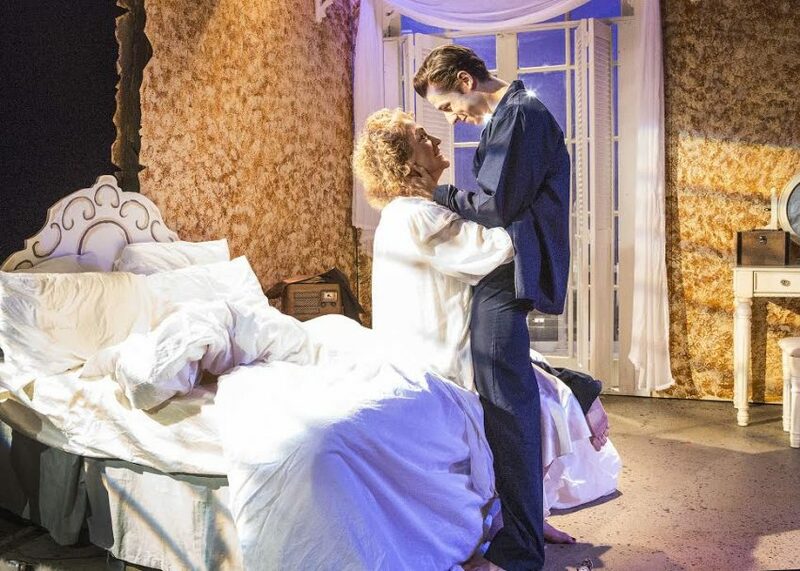 The Gallery Players' rendition of Sweet Bird of Youth is all the beautiful raw tragedy at the heart of Tennessee Williams' works, which is perhaps the greatest gift an audience can get. Under the flawless direction of Jesse Marchese, these actors deliver. Opening up in the Royal Palms Hotel in Saint Cloud, we see the 29-year-old Chance Wayne (a stellar Adam Fontana) traveling with a legendary actress (the magnetic Nancy Rich), who is "not old, but not young" and using the pseudonym "Princess Kosmonopolis" to avoid publicity. However, Chance needs her to embrace that publicity to further his own schemes. As it turns out, he brought the Princess to St Cloud because it is his hometown, and he is seeking out Heavenly Finley (Erin Beirnard), his high school sweetheart with whom he is still in love though he has wronged her so badly that she is all but broken. And he is enough of a kid to share all this with the Princess as if she is his agony aunt and not a woman he is escorting as well. The play also weaves through the lives of all those who have remained in St Cloud, such as the Finley family, whose patriarch Boss Finley (James Harter) trots out his children to stump for his political aspirations in a manner reminiscent of recent elections. Tom Finley Jr (Benjamin Russell) and his cronies George (Greg Pragel) and Scotty (Chad W Fornwalt) are out to avenge Heavenly when they hear Chance is back in town. Cory McCants as Fly/Charles is impressive in adopting different postures and speech patterns to portray two different characters in a similar role (Fly is a hotel worker, Charles is Finley's butler). David Couter as the sardonic bartender Stuff, Noelle McGrath as the sweet Aunt Nonnie, and Megan McDermott as the brash Miss Lucy are also notable. Rounding out the cast are Erika Vetter (Violet), Lisa Fernandez (Edna), Benjamin Standford (Bud), and Thanos Skouteris (Hatcher), all on point. All of the actors are excellent vocally under dialect coach Joe Hetterly. They smoothly deliver different Southern accents while never becoming a joke. Even the Heckler (Michael Dylan Flanagan), who admits he is a hillbilly, presents a sympathetic tragicomic character rather than the stereotype he could have easily portrayed instead. Similarly, the fight choreography by Greg Pragel (George) is also seamless without looking staged -- despite being in slow motion and on a stage. The set, designed by Matthew S. Crane, is gorgeous and versatile, with the same pieces moved or turned around to create a completely new scene each time. This play, written in 1959, shows how human nature is the same, only our technology and resources change. The props, designed by Roxane Goodby, reflect that. Methods of recording and communication (the vintage phone, the unwieldy tape recorder, the television show) all reflect the era but the only difference today is that we carry all those in our pockets.